The Pinocchio Museum: Puppetwork's Pinocchio A Hit! 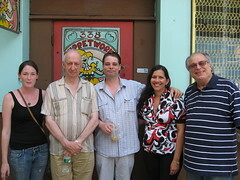 Everyday is Pinocchio's birthday, lately, at The Puppetworks in convenient and trendy Park Slope, Brooklyn. Their perennial top notch marionette version of Pinocchio is currently on the boards in repertory... And it's a rare glimpse of authentic old world puppet goodness. One kid, in the opening warm-up section, called the puppets: "Americanettes"... Cute, huh? These current puppeteer performers (Michael Leach and Jamie Moore) are both lively and dedicated to their craft. And that's no lie! Puppets are oozing in great "character" and they appear extremely well-manipulated, capturing every little nuance and gesture from the sharply written and comically timeless script by Nick Coppola. Voices and music remain fresh and lively... (Voices by Adam Kilgour, Erica Brown "Eureka", Terry Alan Smith), Mr. Nick and the clever and stylish sets by Kevin Frisch are perfect! 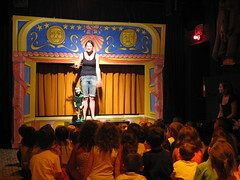 Children in the audience were completely spellbound by this production. Chaperon's were as well, for that matter... This show, at 45 minutes, is, as they say in the biz, "tight"!